Life has a funny way of derailing us from our goals. Sometimes it’s holidays and events that get in our way. Other times it can come from jam packed work weeks and fun filled weekends. My derailment started so simply- a fun Memorial weekend. Day after day of BBQ’s with friends and relatives. This was shortly followed by an exhausting week at work and a two-day weekend biking extravaganza to train for a 100 mile bike ride event coming at the end of June. After all of that, who had time for her new commitment to create daily art and blog about it? Certainly not me. I pumped myself up the following weekend. “This is it, I say” nothing will stop me from restarting my One Zentangle A Day self imposed challenge. Wrong. Tragedy struck our little family. While bike riding back from yet another long bike ride I received a panicked call from my mother with terrible news. My beloved step-father Mark passed away from this world unto the next. My heart literally still breaks as I write this, but I must continue. This was one of the hardest day and couple of weeks of my life. My entire life was put on hold including my art. Our little family banded together in our time of grief, made final arrangements and worked together towards the hardest part of all- saying goodbye. While in Michigan at my father-in-law’s beautiful cottage, Father’s day weekend comes and goes with a quiet remembrance to the father’s that helped raise me. In an ironic twist of fate, my father Dennis also passed away just a week before father’s day 15 years earlier. I do not think I will ever be able to put into words how sad I felt on that day, but like life often forces us to do, we keep moving forward. The bike event I mentioned earlier came that following weekend and was shortened to just 50 miles in light of recent events. Then followed the memorial service for my step-father where our little family once again came together to remember all the things my step-father brought to our lives. At this point in time, the last thing from my mind was my art commitment. I felt that all the creativity I had was emptied from me and poured out into the grief I was still going though. Yet, eventually art would enter my life once again and become my comfort. 4th of July weekend approaches and my husband and I make plans to take our nieces back to my father-in-law’s cottage in Michigan. Finally, I have a chance to get away from the sadness that has overtaken our lives. I viewed this weekend as chance to reconnect with my nieces who I love dearly, my husband and even myself. Slowly little by little, I began drawing in my art journal again. Scribbles and scratches made its way across the surface of a couple of pages. As I calmly rock back and forth on the boat I climbed into, a gentle breeze surrounds me and I am at peace. In the solitude of drawing, I finally find the creativity I have not felt in a while. 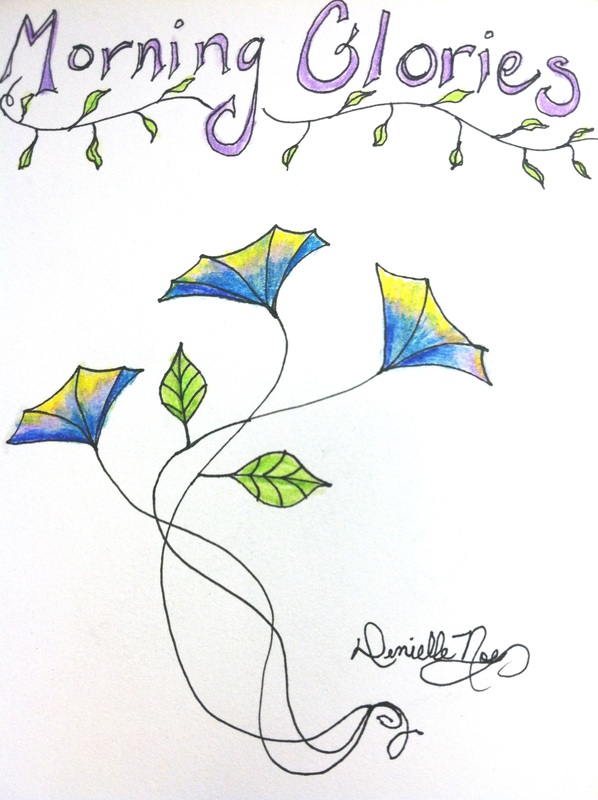 Inspired by a drawing technique by from Helen Williams from her blog “a little lime” I drew my own version of Morning Glories as seen from her video tutorial. Here is the journal entry of the morning glories I drew to which I would like to dedicate to my step-father Mark- thank you for always being there. Oh my darling Denielle … It was heart wrenching to read what you shared. The “Morning Glories” are breath-taking. It soothes my heart that you dedicated this drawing to our Mark. Tears roll down my cheeks. He was “always there” for all of us. When I commented on your site a few days ago, I had no idea that I would see another drawing of yours so soon. The two of us and our family needed to grieve. We needed to take these steps slowly to reach this moment. I am so happy you have returned to a place of peace, serenity, and happiness … just as Mark would have wanted it. I know just how much we miss him and will love him dearly always because like your Dad too, they both will live within us forever. I think you are amazing daughter and I will love you too … to infinity and beyond!